I’m staring at a stranger. He has a red-brown beard. He has a freckle under his right eye. His eyes are pale blue-grey, and fixed on mine. I’m not sure how long we’ve been looking at each other—long enough, certainly, that the cold has seeped through my jumper. It’s been long enough that I’m no longer worrying about laughing, or thinking about lunch, or trying to communicate telepathically. It’s been long enough I’m just staring, and breathing. No, I haven’t become trapped in a staring competition on a train. 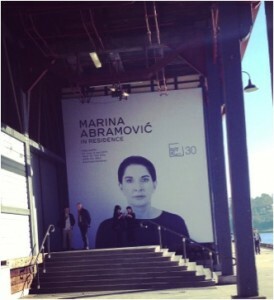 I’m experiencing the latest project from the Serbian born, New York based performance artist extraordinaire: Marina Abramovic: In Residence, which is currently in Sydney. Marina is a rare figure. She’s a performance artist who has mass appeal. She’s done collaborations with Jay Z and Lady Gaga. People lined up for hours for the chance to sit opposite her and stare into her eyes. She’s famous enough that even if you’re tragically non-arty, you’ve probably heard of her or her work. I fall into this category. Courtesy of an artsy friend, I knew about Rhythm 0, which saw Marina lay out 72 items on a trestle table with the note “I’m an object, you can do anything you want to me.” The objects ranged from feathers, a rose and honey to a whip, scalpel and a pistol with a single bullet. In a terrifying Lord of the Flies-esque scenario, people began by shyly stroking her with the rose and escalated to cutting off her clothing, slicing her skin and drinking her blood. Yikes. You might have heard of The Lovers, the Great Wall Walk, which saw Marina and her lover Ulay end their relationship in style. They walked from opposite ends of the Great Wall of China to meet in the middle and say their farewells. Maybe you’re one of the nearly 12 million people who’ve watched the youtube clip from her show “The Artist is Present,” which saw Marina sit and stare at members of the public. Which brings me back to staring at my stranger. Marina Abramovic: In Residence is an immersive experience, aimed at switching the normal dynamic: it’s not the artist taking the emotional and physical journey in this show, but the public. After relinquishing all of my belongings—my phone, my watch, and my bag—I don a black pair of sound cancelling headphones. They feel slightly too big for my head, but I don’t have much time to worry about ruining the aesthetics: I’m being ushered into the space, and a man (dressed all in black) takes my hand and starts to walk with me. Sun is streaming through the window, catching the dust motes. We walk slowly. Very, very slowly. This is the first experience: the ‘slow walk.’ It feels like we’re acting out a slow-mo for a movie, lifting our feet agonisingly slowly, and moving millimetres at a time. It’s a lot harder than I thought it would be. I worry about falling over, or walking too quickly. Am I Doing Art Wrong? Out of the corner of my eye, I see Marina embrace someone. Is that part of the experience? Am I ready for a hug? I don’t get a hug. I am led by the hand, through the draughty space, over to a chair. I sit. A stranger sits opposite me. He has blue-grey eyes. We begin to stare. It’s awkward and uncomfortable, at first. I don’t know where to look. His eyes? His forehead? He looks like he’s taking it seriously – what if I laugh and ruin everything? I decide to stare in his eyes, because this is Art and I am being brave. It’s weirdly intimate. I wonder what the strangers name is, and what he does for work, and whether he’s feeling really cold as well. Time passes. People sit next to us, and stare at each other, and leave. Someone takes our photo. We keep staring. I count to 500 before I stop, guiltily, wondering if that counts as cheating. After a while, I stop worrying about how long we’ve been staring. I decide that I will stay in the chair forever—or, at least, until the end of the hour. Just after I decide this, the man in all black comes back and takes my hand. I wave slightly to my stranger, uncertainly. He smiles with his eyes. I’m led to a section filled with beds. I’m led to a bed in the corner. I lie down, and the blanket is tucked in around me. I feel vaguely guilty for having shoes on the bed. The blanket smells musty. It is warm under the blanket, and I am comfortable. Through the headphones, I can hear the train rattle past, and the seagulls calling to each other. The sounds are distant. After a while, a woman comes up to me. She mouths ‘it’s over.’ I get up, and walk past all the people wearing blank sound cancelling headphones. I take of my headphones, and the world seems impossibly loud. I reclaim my belongings, put my watch back on, and check my emails. It’s only been an hour. An hour earlier, I’d been expecting to feel a bit silly. I’m not very good at slowing down my brain, and the entire experience is supposed to help you slow down in a too fast world. ‘We constantly like to be entertained, to get things from the outside. We never take time to get in touch with ourselves … our inner selves,’ Marina said. The next time I’m feeling overwhelmed—deadlines looming, adulthood omnipresent—I think I’ll remember sitting, and staring, at a stranger. And then I’ll breathe. Marina Abramovic: In Residence is a free exhibition, open to public aged 12 years and up, from 24 June until 5 July at Pier 2/3 Hickson Rd, Walsh Bay. This entry was posted in Art, Arts and tagged art, performance, Review, sydney. Bookmark the permalink.